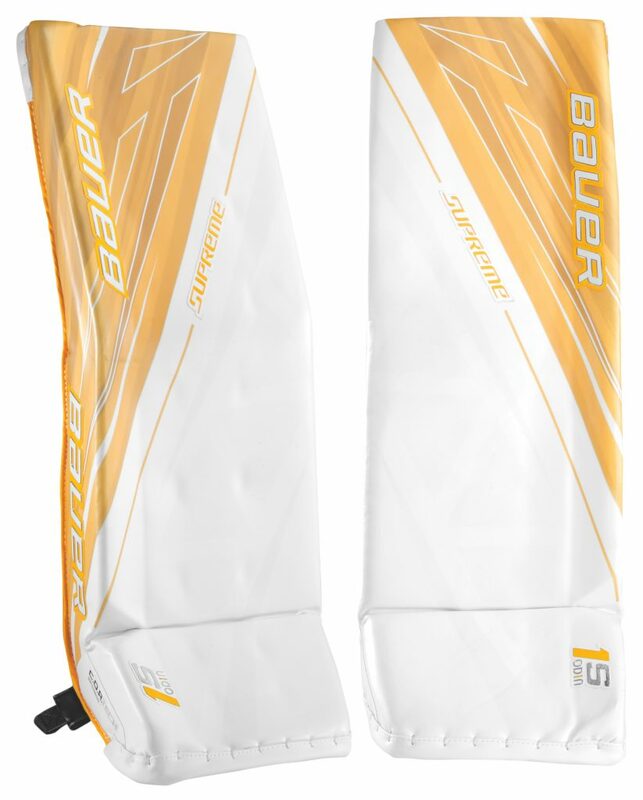 Bauer Supreme 1S OD1N Pro Goalie Leg Pads | Sports Etc. 1S OD1N features C.O.R.TECH Skin technology, which stands for Coefficient of Restitution Technology. Bauer has engineered a skin comprised of Cross linked Polyethylene foam, with Curv Composite additives, lycra-spandex, poly-urethane, digital printed graphics and clear coat to seal it all in. Sliding speed is dramatically increased with having all seams, stitches and potential bindings getting in the way and an even more solid pad seal and allow the rebounds to kick out even more. A new style strapping system, the Custom Rotation System, allows for full Velcro strapping and adjustments for an extreme dialed in fit. The elastic toe ties now resemble a bungee cord effect, where it can be tied tight to the front of the skate, but also allow for ultimate freedom of movement and tension release on the ankles. The boot strap is also made of an elastic material which provides the same function as the toe ties. The entire knee lander is made of Poron XRD foam which provides a stable, yet comfortable landing surface. Sports Etc Performance To Value Rating– 8 out of 10- A lightweight, flexible pad using cutting edge technologies that compliment the modern butterfly goalie. and choose Sports Etc as your store!